RV plumbing is a huge topic. I have several pages dedicated to the subject, but this is your “start here” page for the topic. Traveling in an RV is a bumpy affair. The longer the trip, the higher probability of a loose fitting. Observe for leaks carefully after a long trip. RV's have water pressure turned on and off all the time. Water cycling could cause leaks in a water system. Watch for water leaks even more diligently after long periods of being without pressure. I believe that RV's experience a greater range of temperatures. Temperature cycling would cause leaks due to expansion and contraction of rv plumbing fittings. Have you ever seen northern US roads after a cold winter? That is temperature cycling. This is the same with your RV. If an RV has been in storage for along time, rubber gaskets and washers can lose their ability to be a gasket. They can become dry, hard, and cracked. Many RV parks can have too high water pressure. While RVs are designed to manage water pressure – they have a pressurized system – anything over 30 psi is too high and that pressure can cause leaks in your RV. When leaving the RV for more than 2 days, turn off the water to the RV. This may cause your fittings to get dry, but if you are gone at least it won't spring a leak for 30 days unnoticed and cause a $10K floor repair. Whenever you turn off the water, make sure you turn off the hot water heater. Heating an empty hot water heater will cause you buy a new hot water heater. Whenever the water is turned off, but you aren't taking off, open a faucet and reduce the pressure in the system. When turning water back on to the RV, check all of the fittings to make sure there are no new leaks. When you are unsure of the external water pressure, make sure you have an incoming pressure control valve. Article on fixing a bathroom sink in an RV. Check out the fresh water inlet article. Tighten those plumbing fixtures regularly! Glamping – the coolness of hot water. I'm sure there are many other plumbing leak reduction ideas, so please either add comments to this page or contact me. Did you know that RV52.com has RV books on Amazon, Barnes and Noble, and Apple? You know you are glamping when the shower's hot water hits you! 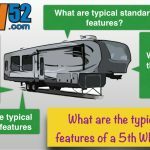 What is a 5th Wheel RV? What are its KEY features? RV plumbing repairs are EASY! A visual walkthrough of my easy to re-create Tiny House plumbing, which is set up for on-grid or off-grid parking with a greywater system. RV Walk-Thru: Water Systems - Learn how the water systems work on your RV. Tim and Sherry walk you through the workings of your RV's water system. City water hookups, grey and black water, water pumps, and much more! RV Plumbing Leak Diagnosis & Repair - Practically For Free! Here's how us DIY RVers diagnose and repair elusive problems. Even though your RV's plumbing system may be different, this detailed look at the process may help you fix a similar problem. How to improve RV plumbing! Access RV Orientation Video Series: This shows how what your water system is, what you should know about it and what you can do about it. A quick look at various fittings in the RV. Replacing my RV copper plumbing with brand new PEX pipes. We have a 1976 Aristocrat trailer and we have a clogged water line The sink drains but comes up through the shower drain. The toilet flushes fine. We have tried using vinegar and baking soda and a commercial drain opener and still no luck. We cannot find a plumbing schematic on line that shows our trailer on it. Our model is a M-17. If I read between the lines… the sink to the shower is clear. The toilet flushes fine, which it would because it has a direct pipe to the black tank. But the shower builds up water and that is the problem. Is your shower draining at all? Or is everything draining fairly well, but the sink drain gets into the shower. It sounds like the shower is not draining based on what you wrote. Can you confirm?